The 30th North Carolina Infantry is the story of civilian-soldiers and their families during the Civil War. This narrative follows a regiment of Carolinians from their mustering-in ceremony to the war's final moments at Appomattox. These Tar Heels had the unique distinction of shooting at Abraham Lincoln on July 12, 1864, when the President stood upon the ramparts of Ft. Stevens, outside Washington D. C., as well as earning the right to say they fired the last regimental volley of the Army of Northern Virginia. The Tar Heels tell their stories through the use of over 2,000 quotes, enabling us to hear what they experienced and felt. The 30th North Carolina follows these Carolinians as they changed from exhilarated volunteers to battle-hardened veterans. They rushed to join the regiment, proclaiming, ""we will whip the Yankees, or give them a right to a small part of our soil, say 2 feet by 6 feet."" Later, once the Tar Heels experienced combat, their attitudes changed. One rifleman recorded; ""we came to a Yankee field hospital...we moved piles of arms, feet, hands, all amputated from hundreds of wounded human bodies."" Then, by 1865, the regiment's survivors reflected upon what they had experienced and questioned, ""I wonder--when and if I return home--will I be able to fit in?"" 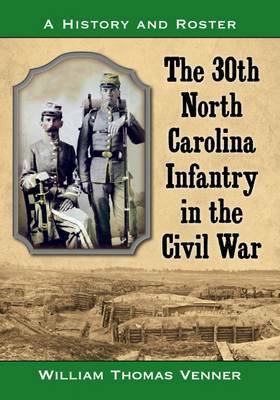 The 30th North Carolina is an intensely personal account based upon the Carolinians' letters, journals, memoirs, official reports, personnel records, and family histories. It is a powerful account of courage and sacrifice.